One thing’s for sure, there’s a wide difference between the wisdom of God and the wisdom of the world. When I say wide, I mean Grand Canyon wide. I mean the distance-between-the-east-coast-of- America-and-the-west-coast-of-Europe wide! I want to help you be a woman of impact who expects great things from God and moves in the power and grace of Jesus. That’s why I’m hosting a FREE Online Bible Study of I Want It ALL. Sign up today and get started! Sign up here. 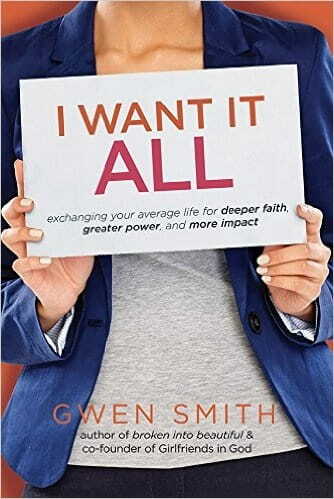 I’m giving away 3 copies of I Want It ALL. To be entered to win, click here to leave a comment letting me know what you’re looking forward to most in the study! Order yours today from Amazon, Barnes & Noble, ChristianBook.com or your favorite retailer.